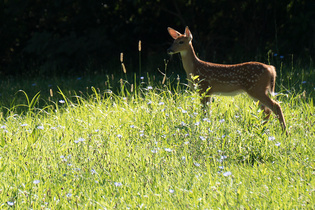 (raw file: https://drive.google.com/open?id=0B7ZsyhVjBC94QTM2R0FfeS1rRk0) I'd rather the deer be a bit larger in the frame. Also, because I had to zoom in all the way to get the deer to appear this close, it turned out low-resolution. An article I found elsewhere recommends picking at the stuff they're grazing on to make them more comfortable, but when I tried this I found that it either scares them or doesn't seem to do much of anything. Equally unuseful (and probably peculiar to onlookers) is squat-walking toward them in a broad zigzag pattern. Could it just be that I'm not patient enough? I've spent what felt like ten minutes slowly inching up to them, and they still either naturally wander off or hop and run away whenever I get within about 20 feet. My neighbor's allegedly been able to see them drinking out of his bird feeder from inside his house. They've likewise seemed pretty calm when I've peered at them from behind my fence, but the most recent time I climbed over it to get closer they grew scared and bolted. 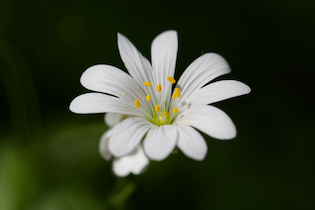 Simply investing in a better lens isn't an option; I need to know how to get closer. The only ethical ways to get closer is to either use a lens with a longer focal length ("more reach"), or to view them in captivity, such as in a zoo. Trying to get closer to wildlife will only stress them (which you have observed their reaction — to run away). Without stalking the deer, you can use the approach favored by hunters: be in places they are likely to be before they're there, and wait. Usually that means sitting in wooded and grass/wooded border areas, starting an hour or so before sunrise, and applying lots of patience. Move slowly, stay quiet, and enjoy the time with nature. Baiting and feeding, even if not directly intentionally "baiting" them (such as your neighbor's bird feeder) is training the wrong behavior into wildlife. While docile animals such as deer don't present much direct danger to humans, the exact same inadvertent feeding behavior also attracts larger animals such as elk, moose, and bears (if they are indigenous to your area). All of those animals can be dangerous to humans, and at best require relocation once they become accustomed to human-provided food sources. At worst, they have to be put down (conservationists use the phrase, "a fed bear is a dead bear"). Short version : you need more shutter speed. Crank up ISO, use widest aperture and trade both for shutter speed. Well I'd consider 20 feet good enough. Actually pretty good. And if you spook them, even a young deer is a pretty big animal if it decides to run at you, rather than away. The lack of sharpness is not an issue with how close your are, it's that this image (and presumably others) have visible shake. I checked your RAW file in RawTherapee. So I'd suggest the issue here is shutter speed. Yes, I know the lens has image stabilization, but it's either not working or not good enough (EXIF data does confirm it was "on"), or you're pixel peeping, which I suspect is the real issue. That shot was at 200mm and on an APS-C the rule of thumb to avoid shake would be a shutter speed of the inverse of 1.5 times the focal length. That's about 1/300th, not the 1/125th you have. But note that that rule of thumb relates to an 8x10 print. The modern tendency to zoom in to the max on screen means you need a much higher shutter speed to get what you want. You can think of it like this : doing that zoom in on screen means you're effectively at a much higher focal length. So all that image stabilization is being soaked up by wanting pixel level sharpness, and that's why you need more shutter speed even with image stabilization. I'd suggest cranking up ISO to 400 or 800 so you can get a shutter speed of 1/500th or 1/1000th. Also crank open aperture to the max. f8 isn't any benefit to you here, but the extra light will get you more shutter speed and/or lower ISO. It's won't make any difference to resolution on that lens. You might also consider using a monopod or tripod (really tricky in this scenario I know) to gain stability. Practice you shooting technique as well - this will get you better shots generally. Do not rely on image stabilization. Now your lens may not be an ultra sharp pro lens, but it's perfectly capable of getting a good shot. Don't blame the lens. Shooting with higher shutter speeds will reduce motion blur and potentially increase crispness by freezing motion. With a subject tens of yards away, an aperture wider than f8 will probably provide adequate depth of field at 200mm. An ISO higher a couple of stops higher than 100 will probably not introduce unacceptable noise. Picking up two or three stops of shutter speed is probably worth the tradeoff when shooting wildlife because it increases the odds of getting an acceptable shot and producing better results when cropped. Using a hide or a ghillie suit is probably another option, but may not be the kind of trouble you plan to go to. And yes, ten minutes is far too impatient. And quite honestly, you'd be better off, safer, and would put less stress on the animals by simply using a longer lens--even a 70-300mm lens would give you more of a fighting chance. Or cropping. Fieldcraft is not something everyone can learn or do well. And we all know that guy. Hours (or even days) is not uncommon for the really dedicated wildlife photographers. Go watch a behind-the-scenes episode of Planet Earth II sometime, and get to the bit where the photographer mentions living in a hide for over 100 hours to get one shot. Do the math. 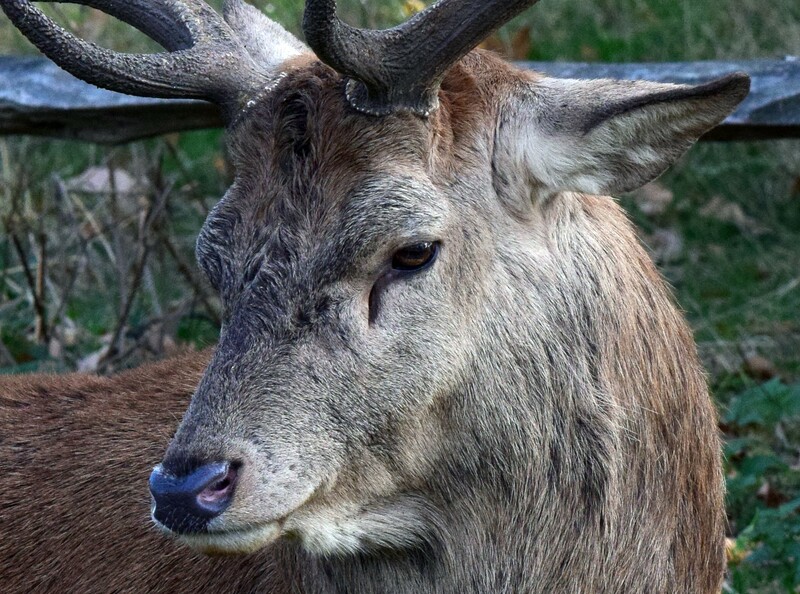 I often photograph wild deer in our Royal Parks in the UK, the trick is keep your distance, much better to have a good photograph of a deer at distance than one close up where you may be on the receiving end of the antlers or interfere with their natural behaviour. Try to buy the best lens you can afford and then crop the photograph down, I use a 200-600mm lens which allows me to take photos from about 75 metres away and then crop if needed and get pretty good results. Keep in mind that you can rent better lenses for not very much money. (For example, at the time of this writing, rentlenses.com has the Canon EF 100-400 f/4.5-5.6L for $100 for 7 days.) You may be able to find local places that will rent for fewer days for less money. And if you have any friends who are photographers, perhaps you could borrow a longer lens? If not, check out local meet-ups or photography groups. There may be people willing to lend you stuff if you do the same in return. 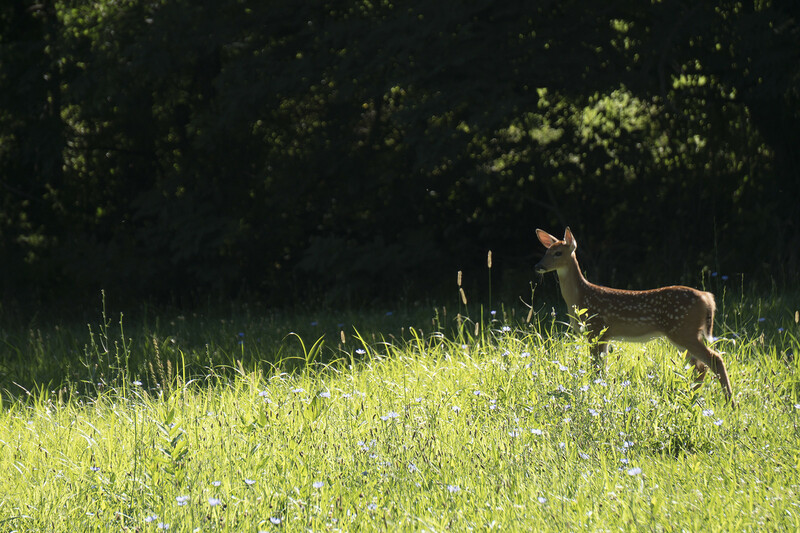 If you know the deer graze in a certain area at certain times of the day, you could rent or borrow a 300, 400, or 600mm lens for a day and go out to that spot when the time is right. I've had good luck capturing deer with a 300mm lens from 100ft. (30m) away. If you can persuade them (with food?) to come closer to a window or glass door of your house, they often will not notice you through the glass if you move slowly. 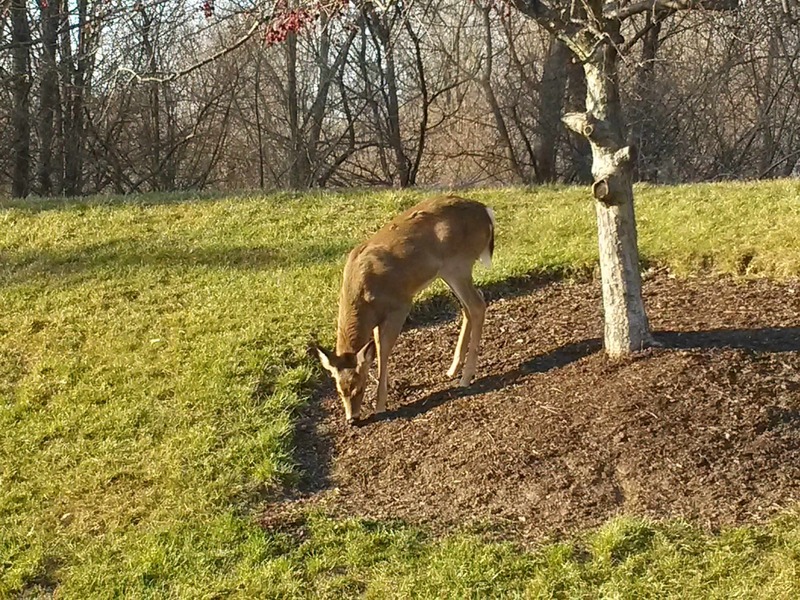 I used to work at a place where the deer were often just a few feet away from a window and was able to snap some pretty close pictures (only a cell phone at the time). One option that wasn't mentioned here (albeit a risky one) is to leave the camera in the field with a remote (wireless) trigger, or wired if you have one long enough. Perhaps leave a large pile of "bait" in a particular area so you know where to point the lens, then wait for the deer to pass by, hopefully within the appropriate "zone" to get a good shot. If you can get as close as 15 feet, I'd say you should be able to get a wireless trigger work at that range, depending on the hardware. My experience with wild deer is limited to the ones that walk around the UCSC campus, which are much less wild than average (they tend to cross at marked crosswalks, and I've heard tales of students literally bumping into them at night and the deer just looking at them as if to say, "Are you blind or something? "), so take this with a grain of salt. Depending on how comfortable the deer are around people, there's a halfway decent chance that you could walk right up to one if you do it correctly. However, I think that climbing a fence would startle just about anything, including domesticated animals. Better to go around. Walk in their general direction at a slant, not directly towards them. Pay as little attention to them as possible when I'm not shooting. Talk to myself a bit so that the animals know that I'm not trying to be stealthy. Walk at a typical deer walking speed (neither a slow, stalking speed nor a fast, chasing speed). 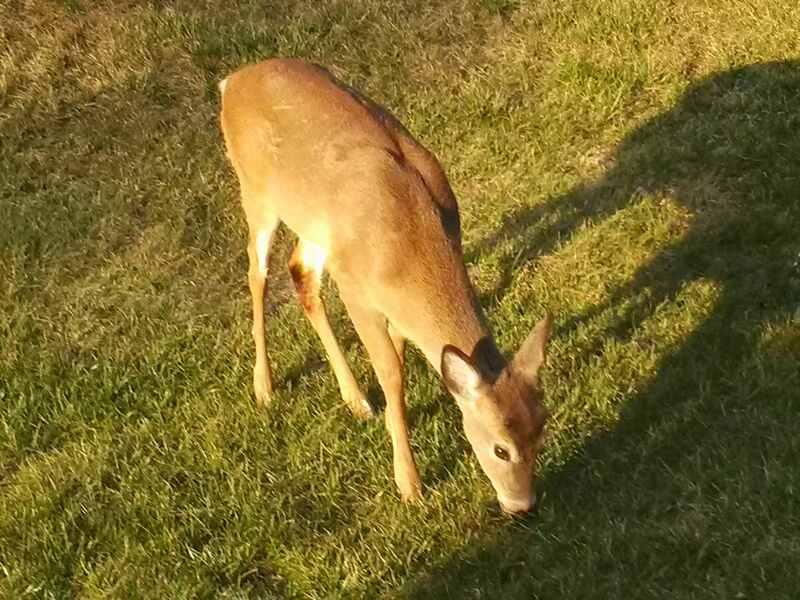 With that approach, I've gotten within probably five feet or so before even the youngest, most twitchy deer even bother to look up, and even they tend to go right back to eating. Again, though, the deer I'm used to seeing are very used to people, so your mileage may vary considerably. It probably also helps that there's not much hunting around here. I would have thought 15' with a 210mm lens was more than adequate; in fact I would expect to have to zoom out a little. I also don't understand when you say that to zoom all the way in results in a low resolution shot Focal length shouldn't make the slightest difference to the resolution. However using the lens a full zoom at 125th of a second is a BIG no-no unless your camera is on a tripod. Handheld your speed needs to be the same as the focal length of your lens or better to avoid camera shake; i.e if you are shooting at 210mm, then your speed need to be at least 250th of a second. Not the answer you're looking for? Browse other questions tagged zoom sony wildlife nature or ask your own question. Should I shoot momma possum and her babies? How do you identify the Common or Latin names of your subjects? How can I photograph hummingbirds? How do you take pictures of creatures which may move away when you get close to them? How to *make* a nature photograph? How can I do an image sequence with a theme of nature (plants, flowers, etc.)? How to photograph distant objects (10km)? How could I make the snake better stand out from the grass in this “backyard wildlife” photograph?